There is currently in Sri Lanka some kind of discourse about education. Many are the possibilities for education if it is not monopolized by the State and hampered and controlled by the mediocre minds of political parties. It seems that some of the areas that are focused on are uppermost in the minds of those who speak seriously about the future of education. 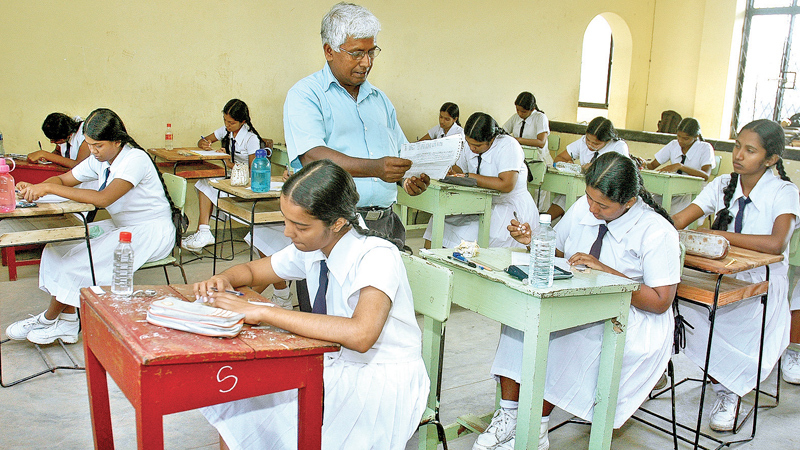 Some wish to make Sri Lanka a hub and a pivot of education, also with an eye on earning income. The purpose of education is never to produce cohorts of mediocre men and women who muddle through life, messing up the lives of others in the process. Education has the mission of a cultivation of the mind and the spirit of human beings, the cultivation of the intellect in a comprehensive and all-round manner that it unfailingly brings about an integral development, an attractive enhancement, and a happy transfiguration in the personalities and pleasing human qualities of all those who go through a worthwhile education. In general, it could be said that education needs to be directed towards the responsible empowerment of all towards the improvement of the human condition and advancement of all people. Education should bring about greater order and well-being of all sections of the people and of humanity in general. Education brings about greater order and discipline through knowledge and understanding among people and extinguishes ignorance and confusion. Though education could impel the educandi to exert to the best of one’s abilities and excel in many ways in the manner each one is gifted, it need not be to compete with or outshine others. No one needs monuments to commemorate one’s high achievements through education; the remembrance of a grateful people for any service rendered to any community or even the gratitude of a single person for some good done is reward enough. Jesus Christ said, “I tell all of you with certainty, whoever gives even a cup of cold water to one of these little ones because he is a disciple will never lose his reward.” (The Gospel according to Matthew Chap. 10 verse 42). Examinations could be an assessment of capability to go further in one’s endeavours. Undoubtedly, education should not be directed to defeat anyone in anything. Victory and defeat in sporting activities are means of learning discipline and self-control and to accept success and failure with equanimity and grace without descending to inimical rivalry and violence. Those who resort to violence and bloodshed due to sporting activities and use sports to unethically enrich themselves financially are not properly educated or humanly cultured. What are the epitomes, the interests, essences, the challenges, the content and quality of the education that is given to our schoolchildren? What principles, ideals, standards guide their education? Do the principals and teachers in schools, the heads of Institutes of tertiary education, Law College, Vice Chancellors and Professors in Universities inspire and motivate students to be of service to fellow human beings? It is indeed right for every person to earn his daily living by the work one is engaged in; but it is wrong and inhuman for anyone to become an excessively unbearable burden on fellow citizens and exploit their helplessness. Today, many make use of their learning to exploit others. Doctors and lawyers are very prominent in this. Uneducated but crafty, corrupt and malformed characters in politics exploit the common wealth of the people and maladminister the agencies of the State. They initiate, aid and abet the import and use of illicit drugs that ruin the younger generation and become wealthy. These downright despicable fellows have not benefited from ‘free education’; they have vitiated the facility provided. Due to defective home upbringing and lack of due character formation and submission to discipline in school they have imbibed the social characteristics that has made them obscene, foul and vulgar specimens of society; free education to which they have had recourse to has been useless to them. Such people are in no way suitable to be elected and elevated to high office or sit in august chambers. Utile per inutile non vitiatur, Free education that is useless for some does not impair its validity to others. Some of the professionals due to their dedication and hard work in their relevant fields manifest an expertise and shine out in their service to fellow human beings, in saving their lives, in obtaining justice to their fellow citizens and securing their due dignified and honourable place in society. Their education has borne fruit, good fruit at that. Some of us have directly benefitted from their goodness and dedication to duty. Indeed all citizens should be grateful to them for the silent service they render so graciously to society. Is there a genuinely ethical and moral content that gets instilled during the school life of students? Is there a positive contribution that religion makes towards the formation of the will, motivation and character of schoolchildren? Are there methods to eradicate bad habits and instill good ones? Are there ways to form strong and determined characters that make the young virtuous? There are public servants who dedicate their working lives to the just service of all and whose integrity and devotion to duty become very gracious means that bring to people satisfaction and contentment. They are like lights shining out in the darkness. The darkness of corruption that surround them cannot overpower that light. The reinstatement of a public servant who was suddenly ousted, is a good example of darkness not being able to extinguish the light. The human and financial resources and facilities provided to them for their primary, collegiate and tertiary education have been well expended by the State and have produced good fruit; they have become noble citizens. The purposes of education have been achieved in them. If every student profited in such a manner, what a social benefit it would be to the country. At the same time, more than two thirds of the members of the highest legislature who are the badly educated and under-educated under the system of free education propelling themselves to the seats of power and engaging in maladministration and corrupt activity is a telling indictment of the type of education they have received. Further even some of those who have had tertiary education among them have conducted themselves politically in the most disgraceful and unethical manner that one wonders what quality of character they were instilled with. The unprincipled fellows jump from side to side to selfishly secure their own well-being ignoring the good of the people who elected them. They defraud the foreign friends who have reposed trust in them. They try to surreptitiously meet judges and influence their decisions. The half-educated, loquacious chauvinists who have abused their position and used state resources and finances to favour their kith and kin, question the integrity of the Supreme Court judges who unanimously hand down a just decision that turns out to be not to their liking. These fellows who also have not profited from free education and not been properly educated are deciding also about national education and the fate and destiny of the country and its people most of who are better educated than them. It is up to the people to judiciously and wisely assess the situation and discard the buffoonery of anti-social babblers and elect genuinely educated honest people with unblemished characters to represent them in the highest legislature and set about planning among other matters the scope and quality of education that generates civic conscious and responsible citizens.